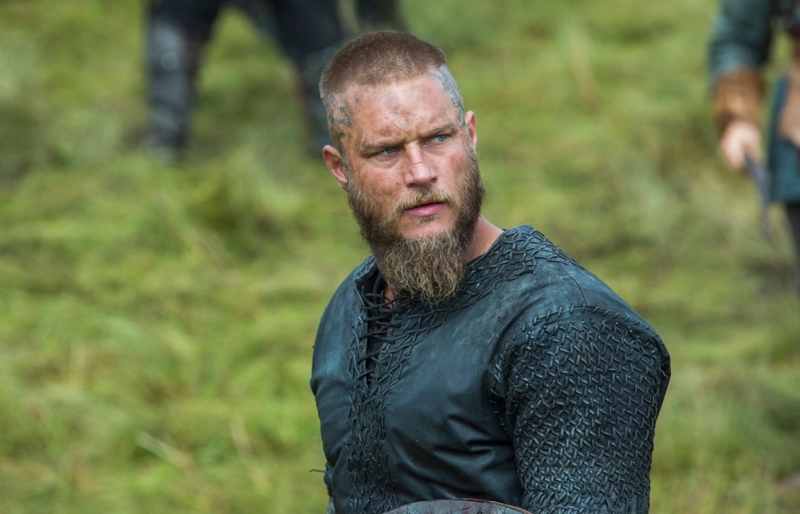 Vikings stars Travis Fimmel (Ragnar), Katheryn Winnick (Lagertha), Clive Standen (Rollo) and Alexander Ludwig (Bjorn), along with series creator Michael Hirst took us on a raid in their long ship (festooned with severed heads) around San Diego harbor at Comic-Con. We came back with some spoils (no, not spoilers) of our own–hints on what happens to the characters when Vikings returns in Season 4. Ragnar’s young sons with second wife Auslaug (Alyssa Sutherland) will be aged up and take on a bigger role. Expect some serious father/son tension and rivalry. And, there will be a new woman in Ragnar’s life: Yudi, a Chinese slave captured in the Red Sea, played by Dianne Doan. To prove his worth as a Viking and to recover from the departure of Porunn (Gaia Weiss), his lover and the mother of his child, Bjorn goes on a spiritual quest. “He decides to figure out his life and go out to the woods,” Ludwig says. “While he’s there, this bear starts stalking him.” The two have a showdown. “Ironically, the bear had a bigger resumé than anyone else on the set. It was the Anchorman bear. I was starstruck,” Ludwig says.